After months of speculation on where Amazon would decide to hold court, the online retail giant finally announced the locations of its headquarters, which will be split in two cities: Crystal City, Virginia and Long Island City in New York. It didn’t take long before City Hall and nearly every politician in town crowed about Amazon’s promise to make at least 25,000 hires in positions paying an average of $150,000, after being promised up to $2.2 billion in state and city giveaways. Of course good-paying jobs are a benefit to New Yorkers. However, we still can’t help but feel the city has really turned its back on small businesses this time. As the long-stalled effort to get the Small Business Jobs Survival Act passed proves, no one is afraid to parrot the real estate industry’s argument that the demise of mom-and-pops has more to do with online shopping than exorbitant rent. At the hearing for the SBJSA, a representative of the city’s Small Business Services agency argued against the bill, warning of “unintended consequences” like landlords being more hesitant to lease to small businesses. A reader sent this letter to Town & Village last Tuesday about traffic problems during ongoing work along Avenue C. A response from the DOT and Con Ed follows. Avenue C has been torn up for over three weeks, between at least 20th Street and 14th Street. I assume this is done by the DOT but I’m not certain of it. In any case how can any responsible agency be permitted to tear up a major access road (this stretch serves as both means of entry and exit for the East River Drive) and leave it in the condition of a veritable mine field? It’s beyond reason. Traffic is slowed to a crawl and vehicles are swerving left and right to avoid major pot holes, exposed sewer covers and gas vents. (On what had been a level street to begin with, I traverse the area daily and there were no issues with this street.) Vehicle and pedestrian safety are severely compromised. One evening last week, Con Edison employed the use of traffic cones and security guards on both 16th and 14th Streets to secure parking for their employees on the Stuyvesant Town perimeter. I believe this was done due to the congestion caused by no parking on Avenue C. Is this legal? And to top it off, that same night DOT (?) was tearing up the intersection at 14th Street and First Avenue. What’s going on here? Why is our neighborhood being taxed so severely by poorly coordinated city services and an out of control power company? If street work is necessary, fine. Tear it up as needed but don’t leave it in this condition for weeks (months?) at a time. Demolition/tear-up should not be permitted unless the repairs are to be made immediately. Is this so contractors can start as many jobs as possible and then get back to them when they see fit? Who is responsible for this? The public is not being well served. However, this week, UPS said that it never changed its policy and that packages could still be left outside doors. Council Member Dan Garodnick was made aware of this in a letter from UPS’s Vice President of State Government Affairs Mark Giuffre, after contacting the company. Garodnick also said he’s since alerted Oval Concierge to the error. He added that there are buildings where owners handle packages for tenants and in those buildings, tenants are notified by UPS that the owner has them. However, said McMackin, there’s no such agreement at ST/PCV. In response to a call from T&V, a spokesperson for CWCapital, Brian Moriarty, said the reason the alert went out is because UPS drivers were the ones to make a call as to whether or not to leave packages in buildings. Apparently they can decline to do so in the event of package thefts being reported at a particular building. Meanwhile, Garodnick said he’s also followed up on another issue relating to packages left in buildings. 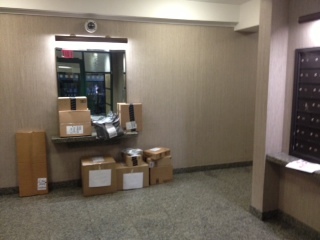 In recent months, residents have been complaining that a third party delivery company for Amazon has been leaving packages unattended in building lobbies. The third party delivery company, which apparently works for various dot coms, is called Special Logistics. They did not return a call by T&V’s press time. McMackin said UPS would be looking into the matter of any packages left in lobbies. “Packages should not be showing up in lobbies,” he said.